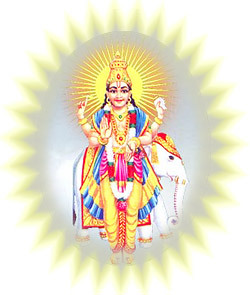 The planet Jupiter in Vedic astrology is known as GURU, BRIHASPATI, and DEVAGURA. In Sanskrit these names mean, "teacher, lord of light, and teacher to the gods." Jupiter is a 2ND most benefice planet after Venus, generally considered to be the most auspicious of the planets. He rules over the two sidereal signs of Sagittarius (Dhanur) and Pisces (Meen). Jupiter exalted and debilitated signs: He is exalted in the sign of Cancer (Karka) and fallen in the opposite sign of Capricorn (Makra). Jupiter bestower of successes: Jupiter is believed to be a bestower of successes. It is generally believed that one who is graced by Jupiter, commands respect from others. Cleanliness is a virtue preferred by Jupiter. Jupiter in astrology is named as 'Guru', meaning, biggest of all planets. The persons with grace of favour of Jupiter enjoy elderly quality, towering respect and business. If it is powerful, it can counter the ill effects of other planets comfortably. Where the Sun is known as Atman, or the soul, Jupiter is known as JIVA, the consciousness of the soul representing the individuality of self. Where Venus is a Brahmin and follows the Brigu lineage of Brahmin sages, Jupiter is also a Brahmin and follows the Angiras lineage of Brahmin sages. Jupiter's epithets are sacred and many: "Lord of sacred speech", "Lord of power", "Guru of the Gods", "reader of minds" and "beloved by the Gods". Jupiter Characteristics: Jupiter is a karaka or indicator of fortune, wealth, fame, luck, devotion and faith, spirituality, charity, morality, meditation, mantra, children, magistrates, ministers, lawyers and leaders in government and religion. Jupiter represents sacred scripture, wisdom, benevolence and philosophy. Jupiter's most favored position is in the first house. He does well both in the Kendra's and Angles, and the auspicious Trikonal Houses. His nature is KAPHA, or watery. His gemstone is Yellow Sapphire (Pukhraj) or Yellow Topaz and his metal is Gold. Jupiter's direction is Northeast and his day is Thursday. As a benefice planet he reaches full maturity the earliest of the 9 grahas at age 16. Jupiter characteristics: Jupiter is the teacher of the science of light, that is, astrology and astronomy. He is the ruler of the Sun and the Moon and controls the movement of the planets. Jupiter is a benefic planet, signifier of luck and fortune, and he rules religion, philosophy, spirituality, wealth, and progeny. He is noble, buoyant, dignified, fruitful, optimistic, jovial, and masculine. If favorable, this planet gives name, fame, success, honor, wealth, progeny and good relationship with progeny, and it brings benefits to whatever planets or house it is associated with. Worship of BRIHASPATI or GURU (JUPITER) Devata results in a cure from ailments affecting the stomach and helps one to ward off his/her sins, helps him/her in gaining strength, valor, longevity etc. He grants the boon of father-hood to the childless, good education (Vidya). He is revered as the Guru of Devas, protector of the world and is considered SRESHTA (matchless) among the wise. Kind-hearted he is considered the Loka Guru and dispenser of justice and can be known only by a proper study of the Vedas. Thursdays are considered to be the best day for the worship of Jupiter. Jupitar organs: Jupiter rules over the liver, thighs, circulation of blood in arteries, and fat in the human organism. Jupitar Diseases: Diseases connected with an afflicted or wrongly posited Jupiter are liver ailments, jaundice, arthritis, swelling, and tuberculosis. Female marriage karka: Jupiter is very important for a female, because it determines her marriage and her relationship with her husband. Jupiter relation with planets: Sun, Mars, and the Moon are its friends. Mercury and Venus are its enemies. Rahu, Ketu, and Saturn are neutral in friendship. Its signs of detriment are Gemini and Virgo.